Welcome, welcome welcome to yet again, another book review! What will it be today? Crime? Romance? Drama? And did I enjoy it…? Keep reading and you will find out. To be honest, the first word that pops into my head from reading this book is ‘stupid’ and ‘short’. I wasn’t expecting a ‘fantasy’ twist in this, if you could call it that. And it just went downhill from there for me. I’m going to warn you now, this MAY include spoilers, so if you don’t want to read any please stop reading! 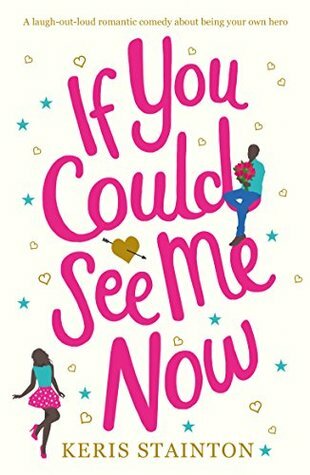 The book is based around the main character, Izzy and her life with her boyfriend who has been ignoring her, and her work/home life. She is unhappy and decides to go out for a girls night with her best friend, Tash. They both get very drunk. Something crazy happens the next morning, and it’s not just the horrible hangover, Izzy has woken up totally invisible. Her life totally changes because of this. She ends up dumping her boyfriend, without him knowing that she is invisible, and also tries for a promotion at her work. She gets to work with the new guy, Alex, who she has a bit of a crush on. It was great that this was an easy read book. It is a breath of fresh air between reading intense crime/thriller’s. I just thought this book was really stupid, and it never explained how or why she turned invisible which really annoyed me. This book was also quite short and I finished it fairly quickly. This book comes into the genres of romance, adults, women’s fiction and contemporary. If you’re into things happening in books that aren’t explained, then this is the one for you. I was really let down. ‘Book of the Week’ posts aren’t always positive ones, but the majority of them are which is what I hope for! Thank you for reading, I hope I didn’t spoil it too much. Ah, sad to hear that this wasn’t a good one for you. I know what you mean. Every book has a reader that will like it. “stupid” books are typically great palate cleansers for me. I wrote a little about that in my post about how to beat the reading slump earlier this month. Sometimes it’s good to read a ‘stupid’ book as it kind of refreshes your mind and gets you ready for a good one. I read what I call “light” books without much depth after reading a super intricate fantasy or something like that. I really actually love some “trashy YA fiction” like The Lying Game by Sara Shepard (the author of Pretty Little Liars) was great to get out of a reading slump. Those types of books are totally a guilty pleasure. LOL RIGHT?! Okay so at least you’re not judging me. I get so much judgement over my guilty pleasure reads! Well it came from a non reader, so I really should just disregard it. It was very unexpected what happened, this book just wasn’t to my taste! No explanation invisibility would have annoyed me too :-p How strange. I think this is one to avoid for me, thanks for the review!